The C strncat function is one of the String Function, which is used to append n number of characters from user specified string to end of the existing string. 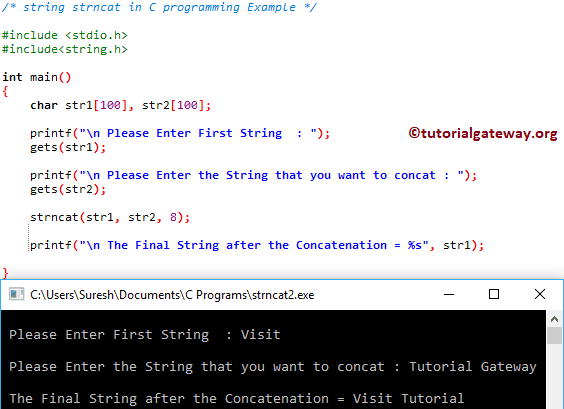 In this article we will show you, How to use strncat in C Programming language with example. The basic syntax of the strncat in C Programming language is as shown below. destination: This is where the function will appeand the charcaters from Source. n: The number of character that you want to append from Source. TIP: You have to include the #include<string.h> header before using this strncat string function. The strncat function is used to append the user specified string to existing string. This program will help you to understand the strncat with multiple examples. This statement will appeand all the characters in str3 to str1 because, length of C Programming Language is less than the given size 40. This C strncat function will append first 10 characters present in str3 to str1 because, we are restricting the size to 10. This program allows the user to enter source and destination strings. Next, it is going to concat them using strncat function. Although, the given string is a valid one, C strncat function only appended up to Tutorial. This is because, we restricted the concatination function to first 8 characters.